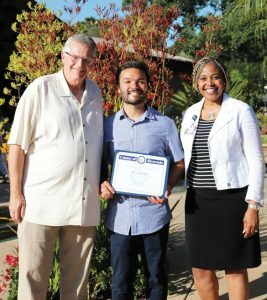 Rancho Damacitas received a generous boost of support during a small gathering on June 29, 2018 to continue helping Riverside County foster youth pursue and achieve their career goals. The BBQ dinner celebrated the accomplishments of last year’s scholarship recipients, including recent college graduate Alex Kerhli, a former foster youth and a scholarship student since 2014. Alex graduated from Point Loma Nazarene University in San Diego in May with a Bachelor’s in Information Technology. He now works for the City of Moreno Valley. Alex was also recognized by Riverside County District Supervisor Chuck Washington for his achievement. “Alex’s education was a great investment and we look forward to seeing how he continues to support his community through his career. We are extremely grateful to those who are helping us make education possible for more young adults this next year,” said Marty Shea, Rancho Damacitas Board of Directors and Scholarship Chair. The New Heights Scholarship program was started in 2012 to make attending college a reality for Riverside County’s former foster youth. Foster youth are usually able to attend any accredited college or university tuition free, yet only 10% of former foster youth try college and of those, less than 3% graduate. The New Heights Scholarships award students between $3,000 – $5,000 per academic year to help them overcome barriers to attending school such as purchasing books, transportation, or meal plans. In addition to financial support, the program offers coaching and resource referrals throughout the year to increase their chance of success. The evening featured food sponsored by New Life Culinary Creations and wine provided by Ponte Winery. The celebration was hosted by Todd and Christene Close at their home in DeLuz. For more information on the scholarship program or Rancho Damacitas, please visit their website at www.4KidsFirst.org or call (951)302-2317.